Wishlist: what should PSP 2 have? Sitting at my computer early one Monday morning I started thinking, “What would I want to see in the next iteration of the PlayStation Portable?” This train of thought was prompted by the release of God of War: Chains of Olympus which has rekindled my interest in the handheld device, along with the introduction of Skype to the PSP Slim which is tempting me to purchase the new model. PSP suffers from poorly placed speakers. No matter how high you turn the volume, it feels like the sound is muffled. That’s because half the time it is, the two sound output orifices on the bottom of the device are often covered by your pinky fingers when you’re gripping it in a manner to use the top shoulder buttons. Why are they outputting sound downwards anyway? It seems they would be more effective at the bottom of the PSP pointing towards you as the top speaker does. Apple got the right idea when they included a hard drive in iPhone, switching out SD cards is a complete mess and could at least be mitigated in part by including a hard drive in the PSP’s successor, which brings us to the next item on the list. UMD’s existence seems to serve as a vehicle for the PSP to have movie playing capability. In that capacity, the PSP has ultimately failed to achieve large scale success. Most users seem uninterested in purchasing movies on a proprietary format that they can’t enjoy on their TVs at home. The target audience for this feature may have been people who frequently travel. Of note, two groups one of our writers has personally seen that fall into this target audience category would be Japanese commuters and deployed military soldiers/sailors. Of the two groups, a lot of deployed military embrace the PSP for its movie playing capabilities, but the PSP fell on its face with most Japanese commuters due to the larger availability of casual Japanese software titles for the Nintendo DS and lack of time to watch a movie on the typical train commute. Unfortunately, deployed military members make up a very small amount of the market and Japanese commuters are a much larger part. This can be summed up as saying, most gamers who buy a handheld are buying it to play games on for short stints, not watch 90-120 minute movies. UMD’s basis as a movie format has failed. As annoying as switching between multiple SD cards is, juggling UMD’s just to play different games is even worse. Sony should learn to embrace the people who came up with features like remote play before the PS3 was even released, and started the whole idea of playing games on SD cards instead of using cumbersome formats like UMD. Stop playing a pointless cat and mouse game which you are bound to lose and open up the next PSP to community developed plugins. It would be great if there was a freely available SDK available for the PSP2 that allowed users to create entirely new interfaces, add support for various audio and video formats and just plain improve on the existing features of the device itself. The shape of the PSP makes trying to hold it in a way to allow access to the shoulder buttons quite difficult and over time quite uncomfortable. It’s also difficult to tell what button you’re actually pressing on the PSP when it’s dark, so some kind of (adjustable) backlighting would easily fix this annoyance. We could also use a second analog stick. I thought we got away from N64 single stick controllers because we realized that such designs were no good? The shiny surface of the PSP is a magnet for greasy fingerprints. Coupled with the highly reflective screen that creates heavy glare in a lighted room and you get a high annoyance factor. Offering the unit with a matte finish and/or in other standard colors besides black, such as white/silver/pink/green/whatever would make it more aesthetically pleasing. Sure, lots of people like black, but not if it shows all your shiny fingerprints. 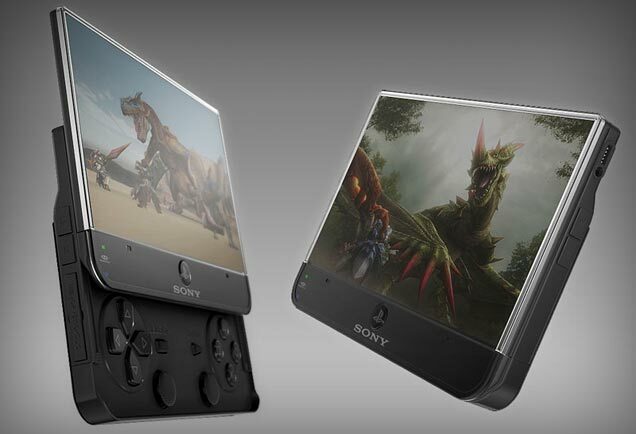 While this concept seems simple enough, Sony has struggled to keep a steady flow of AAA games coming for its handheld. This will be key for the next PSP, because if they could keep great games coming out on a consistent basis Sony, not Nintendo, would be leading in the handheld market. There are so many great companies Sony could tap to make games for them. Perfect example: Sony could have done whatever it took to get a Assassin’s Creed on the PSP, a system that could have actually done the game justice. Instead Ubisoft released it on the DS, and is yet another forgettable action title. Sony could also gain a lot by garnering more support from Japanese software developers and having the games later ported to English. Many casual, trivia, and role-playing games that have enjoyed tremendous success on the Nintendo DS could bring that same success to the more capable PSP. The PSP took some of the focus away from what should have been its primary priority with things like its tagged on UMD movie format, large size, relatively heavy weight (before the PSP Slim), heftier price tag, and lack of software support. Its primary priority should have been concentrating on the reason most people buy handhelds; that is, conveniently playing fun games on the go. PSP2 can get these things right by focusing on features that will make gaming more enjoyable and surpass the experience available on other handhelds.